For past centuries, the study of translating poetry and the translatability of poetry have produced so many academic volumes that could fill a library, and also many concerns have been raised whether it is possible at all to translate poetic texts from one language to another; whether they would win or lose if they are translated. Also, when they are being translated, what should translators seek to do; should they confine to rephrasing the content of the source text or the “atmosphere” of the poetic images, or focus on the “formal characteristics”? 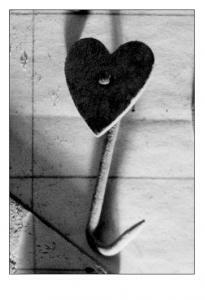 This dilemma has been present for long and perhaps these questions will never be given a satisfactory answer. Alan Turnbull lectures in Fine Art at Newcastle University's School of Arts and Cultures. His artwork can be found in several international public collections including Harvard University's Permanent Collection, The Vladimir Nabokov Museum in St. Petersburg, and Dresden City Council. 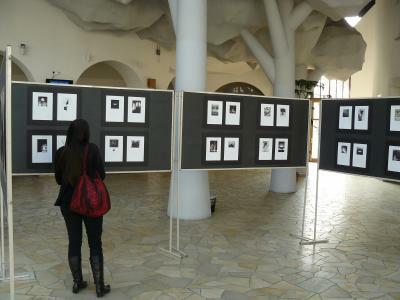 An exhibition of his most recent work (digital prints and etchings) can be seen at the Faculty of Humanities and Social Sciences at Pázmány Péter Catholic University. The exhibition is presented in the foyer of Stephaneum, the central building on campus. The artist’s works have received numerous awards from the Arts Council of England, which signals that the pictures on display merit a close and detailed look. The exhibition area is open to any passers-by who can walk around it as many times a day as they wish. The Translated Images may also be seen as illustrations to poems; but the pictures arranged on four screens with grey background, as if they were windows, offer a new view on the poetry of János Pilinszky and Ted Hughes. Regardless what advanced command of the target language translators may have, certain texts resist being translated from one language to another. It is particularly true in the case of such poetic texts whose complex images, tropes, and motives that may recur in other texts and even volumes puzzle native speakers and readers of the source language to such an extent that they can more or less interpret the enigmatic lines only after reading them several times. This complexity and semantic density also characterizes the poetry of János Pilinszky and Ted Hughes. Alan Turnbull’s etchings and digital prints offer a special interpretation of these two poets’ work, and show how the text of poetry translates into visual images. 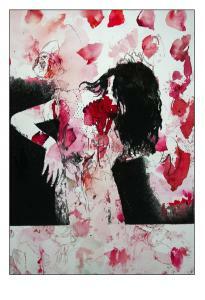 There exists a literary connection between certain parts of the two poets’ oeuvre as Ted Hughes, with the help of János Csokits’ rough translations, turned Pilinszky’s poems into English, and now the artist Alan Turnbull has created a further, visual connection with his pictures on display. 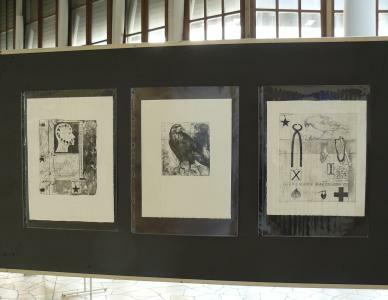 The second sequence comprises etchings inspired by Ted Hughes’ volume Crow: From the Life and Songs of the Crow. Similarly to the Pilinszky sequence, Turnbull spotlights the dark, primitive and sometimes ugly verbal world of the poems; the scratched out, direct and distracted lines are meant to illustrate the voice of the poems and the utterances of language. The language of visual representation transforms inaccessible and indescribable ideas into comprehensible and imaginable ones. It can allow complex signs, which point beyond our linguistic capacity, to become decodable and translatable; thus it opens the linguistically limited terrain and gives ground to another system of signs. And this unique code-switching results in the birth of new works of art.